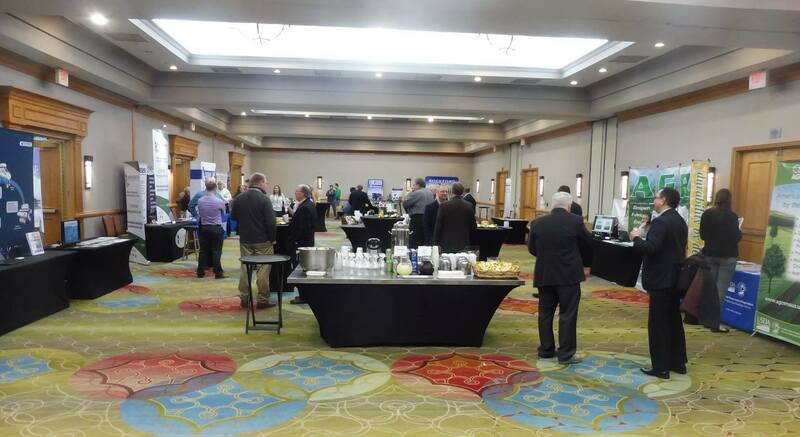 Indianapolis, IN (February 8, 2019) – The 2019 Corn Belt Seed Conference was held Feb. 5-7 at the Indianapolis Marriott North in Indianapolis, IN. The conference featured the Illinois-Indiana Seed Conditioning Workshop on Feb. 5, followed Feb. 6-7 by a program with the theme “Innovative Strategies: Solutions for Tomorrow.” An area was set up during the conference featuring over 25 exhibitors. The conference was the last one for Indiana Crop Improvement Association (ICIA) CEO Alan Galbreth, who is planning to retire this summer. Galbreth received the first-ever Seed Industry Lifetime Achievement award and a video tribute was played during the ICIA awards luncheon. Galbreth has worked for ICIA for 43 years, spending the past eight as CEO. Director of the Indiana State Department of Agriculture Bruce Kettler, who previously worked for Beck’s Hybrids, Atlanta, IN, said on Feb. 7 during the ICIA Annual Membership Meeting the seed industry has a huge impact. He said the department is working to support the industry by assisting in providing outlets and markets for its products. Tom Morrison, MTI & Associates, spoke Feb. 6 about companies creating opportunities and disrupting the usual way of thinking within an industry. He provided examples of companies from other industries that have found success quickly, such as Airbnb, Zillow, Amazon, PayPal, Uber, and online mattresses. According to Morrison, technology plays a key role in changing an industry, and figuring out what is possible with technology can help to drive innovation. The keynote speaker during the Illinois-Indiana Seed Conditioning Workshop was Jim Morris, a former Major League Baseball pitcher who was featured in the movie “The Rookie.” Morris was a high school teacher and coach before achieving his dream of playing professional baseball at the age of 35. Morris credited his grandparents for inspiring him to achieve his dream. He encouraged the audience to help somebody else to chase their dreams. “Dream makers want to see you succeed,” Morris said. A farmer panel discussion moderated by Wade Wiley of Beck’s Hybrids featured Jacob Walker, Walker Farms; Sarah Delbecq, Brechbill Farms; Rick Senesac, Senesac Grain Farms LLC; and Doug Kingseed, DKW Cates Farms. They discussed topics such as the farm economy, using digital technology in their farm’s operations, and accounting software. From left, Moderator Wade Wiley of Beck's Hybrids introduces the farmer panel discussing the farm economy, digital ag, and accounting software: Jacob Walker, Walker Farms; Sarah Delbecq, Brechbill Farms; Rick Senesac, Senesac Grain Farms LLC; and Doug Kingseed, DKW Cates Farms. Jim Morris went from high school teacher to Major League Baseball pitcher in 1999 and was the inspiration for the movie "The Rookie" starring Dennis Quaid. Morris encouraged the audience to help others achieve their dreams.